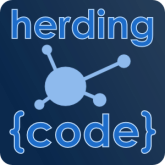 While watching the Channel 9 videos presented by Scott Hanselmann, Jon Galloway and Damian Edwards on the current MS web stack, I noticed the 'Herding Code' sticker on his computer. This points to a podcast that John Galloway hosts with others and where a broad spectrum of new technologies is discussed. Xamarin 2.0: This used to be MonoTouch I believe, a subset of the Mono project with additional libraries for working with mobile ( touch enabled ) devices. This allows you to write .NET code for iPhone, Android etc. Oak: Described as "Frictionless development for ASP.NET MVC single page web apps. Prototypical and dynamic capabilities brought to C#." - I'm going to have to look into that one. Anyway - I'll be adding it to my podcast subscriptions and I'll be looking into these projects.